Note: This article has been taken from chapter 4 (“Preexistence and the Second Estate”) in the book Mormonism 101: Examining the Religion of the Latter-day Saints (Baker, 2015), co-written by the two authors. A distinctive LDS teaching today regarding preexistence is that all living things—humans, animals, plant life, and even the earth itself—had a preexistence as spirits. The idea that the trillions upon trillions of insects and noxious weeds have spirits that existed for aeons prior to their ﬂeeting and seemingly insigniﬁcant existence on earth is a curious thought. Even more astounding is the notion that they will be resurrected to immortal glory at some unspeciﬁed time in the future (Charles Harrell, “This is My Doctrine,” p. 212). Back in that ﬁrst estate, you knew with absolute certainty that God existed because you saw and heard Him. You knew Jesus Christ, who would become the Lamb of God. You had faith in Him. And you knew that your destiny was not to stay in the security of your premortal home. As much as you loved that eternal sphere, you knew you wanted and needed to embark on a journey. You would depart from the arms of your Father, pass through a veil of forgetfulness, receive a mortal body, and learn and experience things that hopefully would help you grow to become more like Father in Heaven and return to His presence (Ensign, May 2013, p. 126). Nevertheless, everyone you see around you—in this meeting or at any other place, today or at any other time—was valiant in the premortal world. That unassuming and ordinary-looking person sitting next to you may have been one of the great ﬁgures you loved and admired in the sphere of spirits. You may have been such a role model yourself! Of one thing you can be certain: every person you see—no matter the race, religion, political beliefs, body type, or appearance—is family (Ibid., p. 128). Brothers and sisters, we are eternal beings, without beginning and without end. We have always existed. We are the literal spirit children of divine, immortal, and omnipotent Heavenly Parents! We come from the heavenly courts of the Lord our God. We are of the royal house of Elohim, the Most High God. We walked with Him in our premortal life. We heard Him speak, witnessed His majesty, learned His ways (Dieter F. Utchtdorf, “O How Great the Plan of Our God,” Ensign (Conference Edition), November 2016, p. 29). This unique teaching can be traced to Moses 3:5 in LDS scripture, which credits God with saying, “For I, the Lord God, created all things, of which I have spoken, spiritually, before they were naturally upon the face of the earth.” Heavenly Father became the God of this earth as a result of his worthiness demonstrated on another planet. 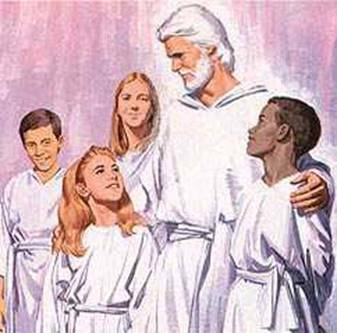 As far as the creation of this earth goes, his ﬁrstborn spirit son Jesus was aided by “many of the noble and great spirit children of the Father.” These included Michael (the preincarnate Adam), Enoch, Noah, Abraham, Moses, Peter, James, John, and even Joseph Smith! (Joseph Fielding Smith, Doctrines of Salvation 1:74-75). According to Mormonism, agency prevailed in heaven, which meant that the spirits had a choice. In our premortal life we had moral agency. One purpose of earth life is to show what choices we will make (see 2 Nephi 2:15–16). If we were forced to choose the right, we would not be able to show what we would choose for ourselves. Also, we are happier doing things when we have made our own choices. Agency was one of the principal issues to arise in the premortal Council in Heaven. It was one of the main causes of the conﬂict between the followers of Christ and the followers of Satan (Gospel Principles, p. 17). We recognize that when God the Eternal Father presented His plan to us at the beginning of time, Satan wanted to alter the plan. He said he would redeem all mankind. Not one soul would be lost, and Satan was conﬁdent he could deliver on his proposal. But there was an unacceptable cost—the destruction of man’s agency, which was and is a gift given by God (Ensign, May 2013, p. 86). Everyone on this earth chose the plan offered by Jesus. Hales explained, “But think of it: in our premortal state we chose to follow the Savior Jesus Christ! And because we did, we were allowed to come to earth” (Ensign, November 2010, p. 25). In fact, “Only those who accepted Jesus to be their Savior can have bodies of ﬂesh and bones. We know, because we have bodies of ﬂesh and bones, that we accepted Jesus to be our Savior. We chose the right things in heaven” (Gospel Fundamentals, p. 11). As a result of his rebellion, “Lucifer, a spirit in a position of authority in the premortal life, was cast out of God’s presence and became Satan because he sought to exalt himself above God and rule over Heavenly Father’s other children” (Old Testament Seminary Teacher Resource Manual, p. 168). One-third of the preexistent spirits who were not wise enough to side against Lucifer will never be worthy of receiving a body on earth and will be forever doomed; their ﬁnal destiny will be Outer Darkness. With all of this said, it is worth noting how the doctrine of preexistence was not a teaching during the ﬁrst few years of the LDS Church’s existence. Spirits or angels mentioned in the Bible as being with God in the ﬁrst estate, including Lucifer and the spirits who followed him (Isa. 14:12–15; Jude 6; Rev. 12:3–4), were traditionally viewed as being a separate species from humans, not preexistent spirits. Biblical passages used today to support preexistence were interpreted differently when cited by the Saints during the ﬁrst decade of the Church (Charles R. Harrell in BYU Studies 28, no. 2 (spring 1988): 77). According to Mormonism, Abraham, the man divinely appointed as the “father of many nations,” pleased God before the creation of the world, so he was chosen to fulﬁll God’s will in the world. Aside from this passage, there is little written support for this important doctrine. This might be the reason why “the Latter-day Saints did not at ﬁrst deduce the idea of preexistence from the biblical passages so frequently summoned today to prove it.” It also does not appear “in the scriptural or other writings and recorded sermons of Joseph Smith” (Ibid., 77, 88). Another passage that ought to be considered is Romans 9:9–12, which indicates that Jacob and Esau had “done nothing either good or bad” prior to their birth “in order that God’s purpose of election might continue.” Notice how neither the blind man nor Jacob and Esau were rewarded or punished based on their good or bad works in a “preexistent” life. According to Mormonism, people are born on this earth based on their performance in a previous life. According to the Bible, life’s circumstances are not random; God’s sovereignty and His glory are what matters! As Jesus and Paul argued, it is impossible to point to a previous existence to support a mortal’s status or destiny. Certain biblical passages have been used by Latter-day Saints to support the doctrine of premortality, though they have to be taken out of their context to do so. One commonly used proof text is Jeremiah 1:5, which says, “Before I formed thee in the belly I knew thee; and before thou camest forth out of the womb I sanctiﬁed thee, and I ordained thee a prophet unto the nations.” This verse emphasizes God’s foreknowledge (“I knew thee”), not humanity’s previous knowledge of God. For more on this verse, click here. Most biblical scholars, however, see God’s question as rhetorical and intended to highlight the fact that Job was nowhere around during the creation. The whole tenor of the Lord’s query, when read in context with the entire chapter, is to emphasize the insigniﬁcance and ﬂeeting nature of human existence. The Lord does tell Job, however, that the “sons of God” were there and “shouted for joy” (Job 38:7), but there is no indication that Job was numbered among them (“This is My Doctrine,” p. 203). In effect, Job was reminded by God that he wasn’t even in existence when God created the world. Just as the clay should not talk back to the potter, so too Job had no business questioning God’s work (compare Jer. 18:1–6 with Rom. 9:18–26). For more on Job 38, click here. Another verse often brought up is Ecclesiastes 12:7, which states that “the spirit shall return unto God who gave it.” The Mormon who holds to the doctrine of preexistence assumes that this is referring to the second leg of a “round trip.” This passage, though, merely shows how life exists beyond death. One would have to approach this verse with a preconceived notion of preexistence to draw this conclusion. For more on Ecclesiastes 12:7, click here. According to Zechariah 12:1, God gave each person a spirit, so certainly the spirit will return to Him for judgment. It does not imply that humans existed before their mortal existence. While the Bible does show how all humans are creations of God, becoming a part of His family requires faith in the redemptive work of Jesus Christ. Paul wrote in Galatians 3:26, “For ye are all the children of God by faith in Christ Jesus.” He also said in Romans 9:8, “This means that it is not the children of the ﬂesh who are the children of God, but the children of the promise are counted as offspring.” Even the Book of Mormon tends to discount the idea of preexistence. Ether 3:14 says, “Behold, I am Jesus Christ. I am the Father and the Son. In me shall all mankind have life, and that eternally, even they who shall believe on my name; and they shall become my sons and my daughters.” A Mormon may argue that this only refers to a spiritual sonship. However, this objection has validity only if it can be demonstrated that the Book of Mormon teaches the LDS concept of the preexistence, which it does not.